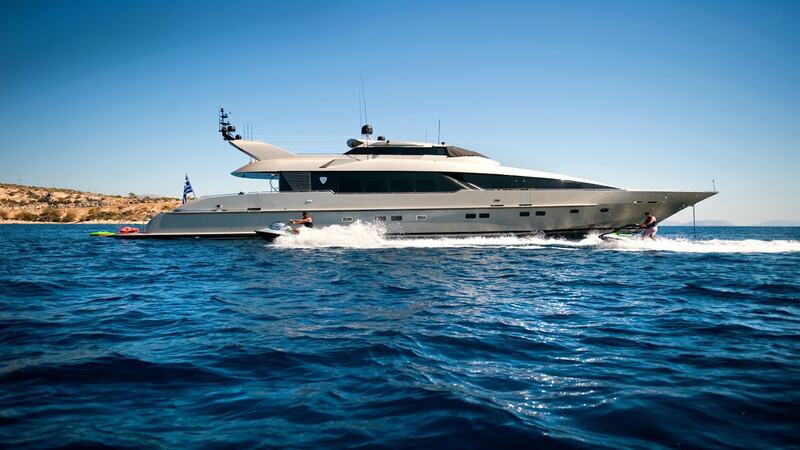 Pandion stands out for her cruising performance, enormous power and presence reaching a maximum speed of 40 knots. She has a beautifully decorated modern interior and provides every comfort on board.With a crew of six to tend to your every need, Pandion can accommodate ten guests in four well-appointed cabins that feature modern décor throughout. Her interiors are contemporary and have been designed with a lot of attention to detail. She features large relaxing areas. Pandion has a large selection of water toys to choose from ranging from wave runners to Kayaks. In 2007, the yacht underwent a full refurbishment, which included full interior and mechanical upgrades. In 2016 she had another extensive refit completely refurbishing the interior, including all soft furnishings and decor. The salon is ultra-modern with low couches and large windows that allow for plenty of natural light. A spiral stairway, made of charcoal burled wood veneer with Lucite handrails and complimenting artwork, also adds to her modern atmosphere.The salon leads on to a formal dining area that can comfortably seat ten guests. Curtains around the dining area can be left open or closed for a more intimate setting, making this the ideal spot for holding meetings as it provides privacy. The guest accommodation is found on the lower deck. The Owner’s suite is situated in the Forward, and takes up the full width of the yacht with its king-sized bed positioned against the bulkhead. To port is a spacious bathroom set out on a semi-circular floorplan and includes a Jacuzzi spa bath. There are also two wash basins, a shower and a separate lavatory with bidet. Two glass paneled bathroom walls uniting it with the bedroom to create the impression of a far greater space, but for the sake of privacy the glass conceals a layer of liquid crystal which at the flip of a switch transforms it from clear to opaque. The remaining three suites, two double staterooms and a quadruple cabin, are each equipped with entertainment centers and en suite shower rooms. Pandion was the fastest superyacht in the world upon its delivery exceeding the world speed record of 35.7 knots at the time. This incredible performance is provided by twin MTU 3,500hp 16V396TB94 diesels, each driving KaMeWa type 63S11 steerable waterjet, and a further MTh 2,560hp 12V396TB94 diesel positioned on the centerline powering a directionally fixed KaMeWa type 40B waterjet used as a booster to achieve the maximum speed. The profile and streamlined superstructure of this yacht hint strongly towards its speed potential.